We are quite familiar with DVD movies for the high video and audio quality. Now, many HD camcorders support DVD recordings, making DVD become the dominant form of home video distribution. Many guys prefer the way to edit home-made DVD video using FCP X. Video editors maybe need to create an industrial video using existing footage that only is available on a DVD previously video. 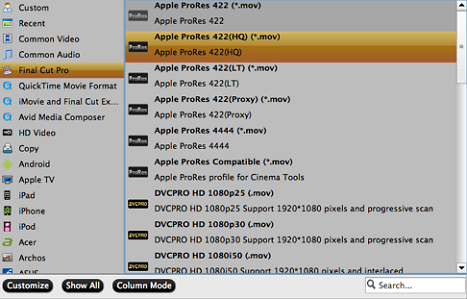 In this case, an effective way to rip DVD VOB to ProRes for FCP X editing is crucial. From this article, you will learn the most effective way to achieve this. "I am busy with a project where I rip DVD to prores for editing. The usage for the progress was to remaster shorter version in FCP X then back to DVD. Please advise as i have to finish this job soonest". Aunsoft iMeida Converter for Mac, an effective DVD to ProRes Converter, can help you fastest rip DVD to ProRes 422 and ProRes 4444 on Mac. The program can utilize all cores to speed up the process and work well on the latest Mavericks. With the clear interface and easy-to-handle workflow, you can encode DVD to Apple ProRes with only 4 steps. Supporting batch conversion, you can leave the project alone and select "Shut down the computer after conversion"
Is it possible to decrypt protected DVD to ProRes? Yes. 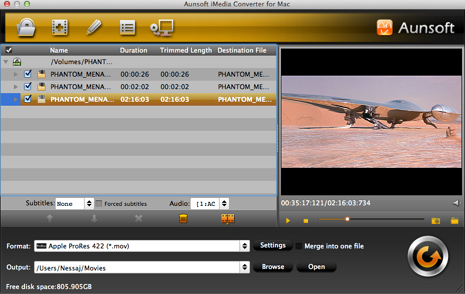 iMedia Converter for Mac can decrypts BD/DVD copy protection and enables you to make a copy of BD/DVD movie with ease. For DVD movie, the program can deinterlace video and remove the artifacts by default, ensuring you to enjoy high quality videos without being annoyed by unexpected interlace artifacts. Adopting hard-burn technology, you can also choose only show forced subtitle and select audio tracks. Below is a simple 4 steps to stream DVD to ProRes for FCP X editing soonest. If you are windows user, you can turn to Aunsoft Blu-ray Video Converter Ultimate, a multiple video supported video converter, as well as a professional DVD/Blu-ray Ripper. Insert DVD disc to DVD-ROM as the source file. Click "load files". You can also drag & drop directly. "Copy the entire disc" is for 1:1 digital copy the original file with the same content. Her Click the Subtitle option and you choose the prefer language you want from the drop-down list. You can select forced subtitle and audio tracks here. Click "Format" and choose Final Cut Pro -> Apple ProRes 422 (*.mov). Click "Conversion" icon that the iMedia Converter for Mac will decrypt DVD to ProRes MOV for FCP X editing. With just a click on "Open output folder", you can locate the export file quickly. After you remaster shorter version in FCP, you can easily back ProRes to DVD with Roxio Toast or other Burner.